Pictured is the grassy area located behind the first base dugout at Olentangy Liberty High School. In the coming months, the spot will be occupied by a new indoor hitting and pitching facility. The plans for the new facility were presented to the Olentangy Board of Education last week. 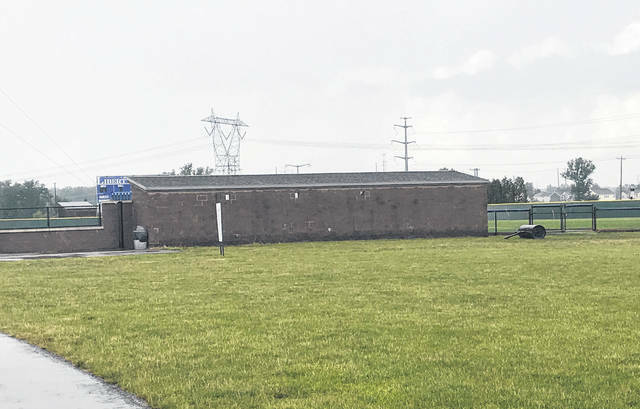 Fresh off its first-ever state high school baseball championship, the Olentangy Liberty athletic boosters are investing in the program’s future with a plan to build an indoor hitting and pitching facility. The details were presented last week to the Olentangy Board of Education by Project Coordinator John Stickel, Booster President Eric Kunar, and Malcolm Rausch, a booster parent representative. Previously, the project plans had been approved by the district’s facilities committee. Construction is expected to begin this summer. The steel facility is slated to be 72 by 96 feet and will be constructed just south of the varsity baseball field, directly behind the first base dugout. It will be heated but will not have air conditioning. In his presentation to the BOE, Stickel said the building will have several overhead doors that can be opened for ventilation, but air conditioning will not be included because baseball is meant to be played outdoors, in the heat, anyway. He did say, however, that should the demand for rental of the facility in different seasons necessitate it, adding air conditioning could be considered in the future. As for the interior of the facility, Stickel called it “pretty simple,” adding there would be a hitting area with netting and a pitching area with portable mounds. Building costs are estimated to total $330,000, but Stickel said the boosters are also budgeting for an additional $33,000 in unexpected costs, bringing the total budget for the project to just over $363,000. A $400,000 private loan with favorable terms was given to the baseball program in order to fund the construction. The length of the loan is seven years, with a guaranteed interest rate of 3 percent that will begin in year two of the loan. Stickler said a $90,000 payment will be made on the loan before 2019, bringing the loan amount subjected to interest down to $310,000. During his presentation, Stickel said the idea of constructing such a facility began 15 months ago as their previous investment — turf for the varsity baseball field — neared full pay off. Initially scheduled to be paid off by 2020, he said they were able to pay off the $316,000 turf through money generated from contracts by other teams and programs to rent the field. In paying off the loan ahead of schedule, he said they were able to save $8,000 in interest. Stickel added the lifespan of the field turf is 8-10 years, and after the turf was inspected and reviewed last year, it was deemed in excellent condition with a projected replacement year of 2025 or 2026. Replacement of the turf is estimated to cost anywhere from $250,000 to $275,000. Through the rental contracts, the program receives $85,000 in income per year, and Stickel expects an additional $50,000 in donations to come in from the community. He also offered a low estimate of an additional $20,000 per year in income for rental of the indoor facility but did say the plan was not to rent the indoor facility in the same way the field is rented.